Have a desire to bet the slot machines that have spent years taking your money? Well now you can. Here are some tips to improve your odds. Using high-packback machines can improve your chances of winning. Your probably asking yourself, what is a payback? A payback is how much a machine returns to you after many thousands of plays. These machines not only increase your chances of winning, but they have higher payback percentage and pay more frequently. The longer you play a machine, the closer you get to hitting the jackpot. In Vegas, you can find these machines off the strip, and most frequented by residents who know where the gold mines are. Best casinos: Sam's Town, The Rio, Gold Coast, Orleans, Palace Station, Boulder Station, Sunset Station, and Santa Fe. Choosing machines that allow you to go over the minimum wager required to play can improve your odds. If you bet the max allowed, your odds of scoring are much more likely. False: Machines with the rest paybacks are located by door or in the isle. False: If you leave a slot machine, and the next victim hits the jackpot, it could have been yours. True: The microprocessors inside the machines use random numbers to decide who will be the big winner. Charles Fey invented the first slot machine in 1895. In 1907, Fey teamed up with the Mills Novelty Company and then manufactured the Mills Liberty Bell. The Liberty Bell featured a cast iron case, with a classic Liberty Bell cast into the front of the machine. The slot machine originally had cast iron feet with toes. In later models the toes were eliminated and replaced with ornate scrolled feet. The machine's reel strips depicted playing cards (the king, queen, and jack). It also had a bell that rung when you hit a winning combination. Unfortunately, the ringing bell was quickly dropped. 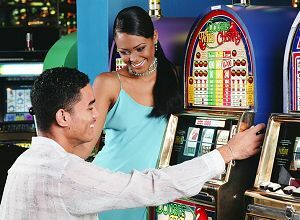 The original concept, however, was not lost because now-a-days, modern slots have a bell which ring to signal that a player has hit the jackpot.